Verder provides tailor-made, automated water pressure booster sets that are capable of responding automatically to changing levels of demand. 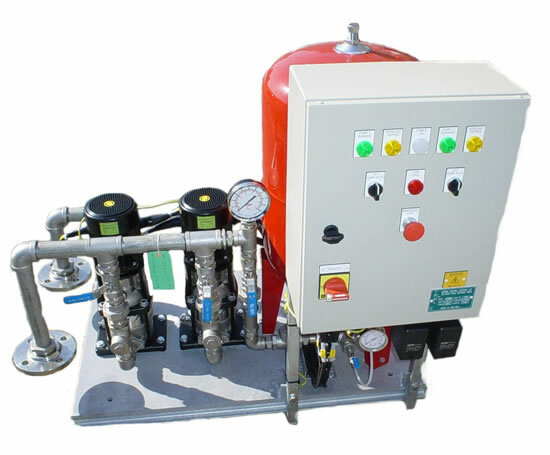 Water booster packages are suitable for applications with wide variances in demand for water. Verder can provide packages to suit specific applications or to fit a complete process. Applications include hotels, offices, industrial units or sewage works. Selection of pumps and design of water booster sets are tailored to specific system requirements, meaning that their scope of use is wide, including: potable water supply, screen washing, irrigation, seal flash systems and process water feed. Their flexible design allows them to be well matched to requirements. High efficiencies are generated by the low motor power with fixed and variable speed options. Verder pressure booster sets are simple to install and easy to operate. Booster sets are built and tested in Verders own workshop, reducing the amount of work to be carried out on-site. This makes the process simpler and cheaper for the client.